The apartment is located on an elevated position of the characteristic village Mezzolago. 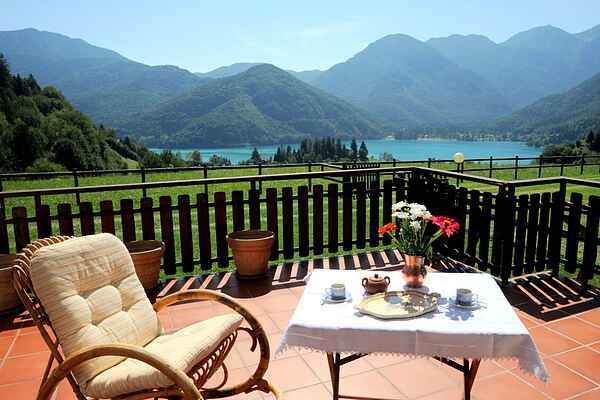 From the private terrace of the apartment you will enjoy a wonderful view on Lake Ledro and the landscape of the surroundings. The holiday apartment is part of a small building community. Wonderful terrace of 20 m2, ideal place for relax and sunbathing. Spacious common garden. Parking in the garage. Accessories: Refrigerator with freezer, coffeemashine, microwave oven, oven, gas stove, satellite television, outdoor furniture.